In its recent program ‘Money & Power,’ BBC did an in-depth analysis on how money impacts people in their lives. While few who with wisdom did not allow the serpent to bite them, others were not so lucky. Quote: “Most people have dreamed of winning the lottery. It’s a dream that has become ever so common around the world as jackpots get bigger and lotteries more numerous. But does money really make us happy, and how much does this depend on where we live and how we spend it? To find out, the BBC’s Mike Thompson meets lottery winners from around the globe. Mike dines with Arab-Israeli Restaurateur, Jawdat Ibrahim, who spends much of his $ 23 million windfall on trying to bring Palestinians and Israelis closer together, through good food and dialogue. Mike meets American businessman Brad Duke, who is determined to put his mountain of money to work. Brad will not be happy, he insists, until he has trebled his $ 220 million winnings. Mike goes dining with the self-declared ‘Mark Zuckerberg’ of Ghana, a man with a very different plan. The young pop video maker likes to flash his cash and seems determined to spend his way to happiness. And Mike meets Canada’s Rebecca Lapierre, who spurned a big lump sum in favour of $ 1,000 a week for life. The former Miss Quebec has dedicated her winnings to helping the poor. True joy, she tells Mike, lies in giving rather than getting.” – https://www.bbc.co.uk/programmes/w3csxgsp. While the great majority of people succumb to the power of money, yet there are few who truly realise what money can be used for, the like of Rebecca Lapierre of Canada. She has what most do not, wisdom and that when by giving you give others happiness, that it is the greatest happiness of all because you have controlled your own greed. Here she has taken hold of the serpent by its neck and the serpent cannot bite her. But a great majority of people catch it by the tail (world leaders) and the serpent will bite, injecting the venom of greed. We see the power of money these days more than ever before. President Trump declared war on China, EU, Canada, Mexico and other states imposing a 25% duty on steel and aluminium imports to USA. Then China and other nations retaliated with reciprocal actions on USA imports. Then USA began working on another $ 200 billion imports per annum from China which China said would be reciprocated when imposed. Then USA said it will impose duty on car imports, and EU and other nations said they will also do similar for imports from USA. USA also stated that they will impose duty on all of imports from China worth over $ 500 billion annually. Iranian President Hassan Rouhani on Sunday 22 July cautioned US President Donald Trump about pursuing hostile policies against Tehran, saying “war with Iran is the mother of all wars”, but did not rule out peace between the two countries. Then on 23 July President Trump tweeted, “Never, ever threaten the United States again or you will suffer consequences the likes of which few throughout history have ever suffered before. We are no longer a country that will stand for your demented words of violence & death. Be cautious!” In all these situations there is the power of money lurking behind. These things are having extremely negative impact on the minds of human beings. Trade wars people fear as they will impact business, cause unemployment and in general create uncertainty. Such negative situations only create hatred in our minds. Hatred is everywhere to be seen. Everyday thousands are getting killed due to hatred of people towards other people. On top of this are the utterances of politicians all over the world. Also within nations there is so much hatred brewing. In the West electronic media are all the time harping on the likes of president Trump, the 2016 elections, Russian involvements, of secretly taped conversations all of which is creating hatred in human minds. In EU there is the matter of Brexit and each day it is getting worse. Business people are wondering what will happen while politicians are trading charges at each other and some have even resigned from cabinet positions in UK. So in short there is hardly any compassion, loving-kindness or altruistic joy to be observed in our world today. Back home in our nation it is no better. Each day there are new charges made by opposing political parties which are further enlarged by the media. Charges are levelled against former President Mahinda Rajapaksa where New York Times in an article claimed that China gave $ 7.6 million to him for his 2015 presidential campaign which both China and the former President denied. JVP Leader Anura Kumara Dissanayake charged that a Chinese company gave Mahinda Rajapaksa Rs. 1.1 billion for his election activities (www.newsfirst.lk/2018/07/17). Then there is the Central Bank bond scam where according to the commission appointed to investigate almost Rs. 11 billion has been lost to the State. Trading and counter trading charges seems to be the order of the day and cause much chagrin to the citizens. These too only contribute to generating hatred. The serpent is happy because in almost all these situations it has the upper hand and make humans what they are. The result is hatred everywhere. Most people other than knowing to hate each other have no idea what hatred is and how it can have an impact on our lives. You can easily discern hatred from the way our face looks when there is hatred in us. Hatred is a force of extreme high frequency and with negative impact. Often it is quite difficult to look at the face of a person with hatred. Opposite of that is loving-kindness. Our planet has four main foundations, Pathavi or hardness, Apo or water, Thejo or heat and Wayo or air. These four foundations too have extreme high frequency and in a state of flux. These four are conditioned things and Buddha said the conditioned have three characteristics, there is arising, ceasing and what is seen as is, can discern change from this to that. (Theeni mani bhikkave sankathassa sankatha lakkanani, kathamani theeni, uppado pannayathi, vayo pannayathi, thithassa annathaththan pannayathi) These four in a flux all the time can be impacted positively by loving-kindness, compassion, etc. and negatively by hatred. Any negative impact on these four, there will be a resultant reaction. Now it is there for the whole world to see, the negative impact on planet earth and our lives. The disastrous floods early this July in Japan resulting in over 200 deaths with millions displaced and damages running into billions of dollars. The extreme heat that has engulfed Japan this week with temperatures over 40 degrees Centigrade, never in the history of Japan and so far 20 deaths. Floods ravaging Vietnam, and the predictions of more high heat and heavy rains across China, Vietnam and Far East. Wild fires raging in Sweden. Wild fires are raging near Athens in Greece and so far has caused 49 deaths. Due to recent heatwave and lack of normal rainfall, there is Drought in England and Wales with water levels very low in the reservoirs. Continuous Volcanic eruptions in Hawaii and Guatemala. Tropical storm Aletta in Mexico in June. Record heat is said to have caused many deaths in Canada. Heavy rains and floods resulted in the collapse of a newly built Dam in Laos with hundreds of people feared missing and more than 20 dead and over 6,000 displaced. In Algeria temperature has reached record 51.3C the highest recorded temperature ever in Africa. The list is endless and continues to keep increasing in frequency. The reality today is that events taking place all over the world among human beings are causing emittance of more and more hatred to the outer world. Politicians continue to berate each other while nations threaten each other from monetary aspects and even military aspects with scant regard to what those can do to nature. If this situation continues with no solution in sight, the next phase could be far worse. Imagine the San Andreas Fault erupting, what will happen to USA? Can President Trump tweet nature and tell nature to be careful or else? Imagine increased volcanic activity taking place across the world. What is causing the current phase of hot and dry weather in the UK? What other factors are contributing to the heat wave? How hot is the UK compared to historical heat waves? Is a similar phenomenon taking place around the world? The answer does not lie in the traditional explanation of global warming as claimed by scientists due to fossil fuel burn and the Co2 emissions. This is mainly caused by the hatred of human beings towards their fellow human beings. Those with the human somatic bodies are termed human beings. But are they? “Manan ussasithi manussanan” – this means that the human beings are those with elevated minds full of compassion, loving-kindness, equanimity and altruistic joy. Can we see these qualities anywhere in the world among all the world leaders? All we see is hatred in their minds and hear only words of hatred towards others. If the leaders do not possess these four qualities, how can one expect the rest to have same? It is time that sanity prevail in our world with more of compassion and loving-kindness. The people as a whole need to move out of the Red Ocean to Blue Ocean. Red Ocean is where you are immersed in the current situation of hatred, anger, greed, ingratitude etc. and unable to get an apex view of things. Blue Ocean is where you extricate yourself from the quagmire and see things from the top so that you can get the best view. The greatest of all the Blue Ocean actions happened over 2,600 years ago in India. In those days many ascetics were looking for a permanent life where there is no death. Thus with mindfulness meditation techniques they achieved various dhayanas. They gained the ability to see the past with mindfulness and to see the future with wisdom eye. But they could only see to some extent and thought that with the dhayana has achieved state of permanence. However, ascetic Sidhartha having achieved all the eight dhayanas realised that the truth he sought was not there. Thus he moved out of that path to ultimately go to the path of Vipassana meditation and got enlightened where there is no more life hereafter, the bliss of Nirvana. 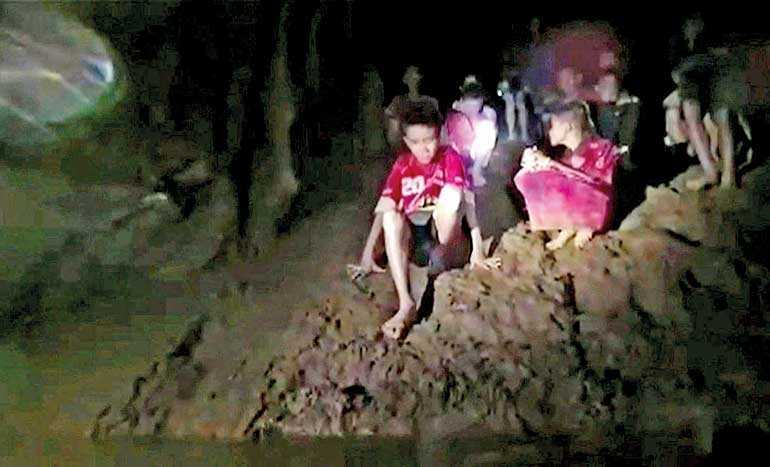 Leaders can all learn from the harrowing experience of 12 Thai boys who got trapped inside a cave for more than two weeks. When the first British diver emerged from the waters into the cave, one boy said ‘hello’ to the diver. They found the boys not frightened and looking quite peaceful. That was because the coach being a former Buddhist bhikkhu and having practiced meditation taught the boys to meditate, calming their minds and making them content with what they had. Their metabolic activities slowed down, resulting in need for little food and water. Unless the global leaders seek the Blue Ocean path of purification as shown by the Enlightened One the Buddha to resolve all these problems, our immediate future could be in grave danger.